so i attended the monthly trabuco canyon show, by the "friends" grill. guessing because it was mother's day, not as many cars showed up. this one was pretty cherry. 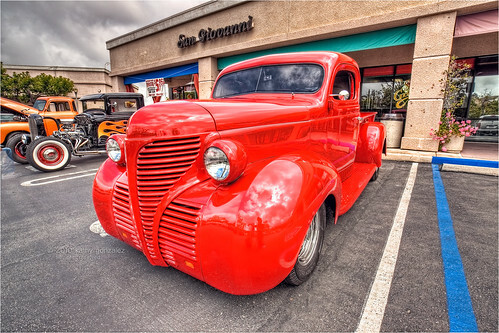 it is a 1939 plymouth truck. the owner was nice enough to close the hood for me; i had to help by pushing it closed while he pulled the release in the cab. he's got it buffed to a fine finish, and it reflected the overcast, cloudy sky wonderfully. love those cloudy skies...adds more drama to a picture, don't you think?